Anyone who knows me knows that I love food and my stomach is a bottomless pit. I could eat at an all-you-can-eat buffet and be full but still feel hungry less than an hour later. I am always looking for something to eat, and when you get tired of your school's dining hall, it's always nice to eat something in your room that isn't instant or microwaveable. I was experimenting with dinners this week and it was all completely random and spontaneous. Over the weekend I bought some single-serve salmon filet's from Albertson's, 2 for $3. As I was in the dining hall getting a to-go box, I went over to the salad bar and decided to get myself some broccoli and mushrooms to save to cook for myself later. I live in a quad-style dorm, where there is one shared living area for 4 different rooms. In the living area, there is a kitchenette where you could keep any electric appliances, like the griddle and rice cooker I have (at my school, it's not allowed to keep these in your room other than microwaves & electric kettles). Big tip: If you live on-campus at your school and don't like eating in the dining hall or eating microwave food all the time, invest in an electric griddle! I normally cook rice & spam with the occasional scrambled egg for dinner, a typical Filipino breakfast. So when I figured out this recipe, I was happy to eat something healthier and different! I made this recipe in my dorm, but you can make it in a kitchen too, of course! 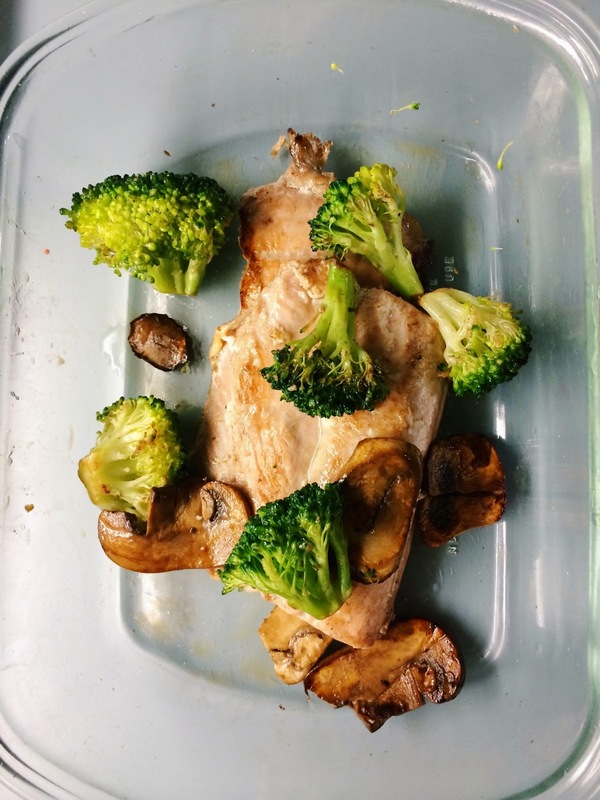 You may also substitute the salmon for another type of fish or the broccoli/mushrooms for whatever veggies you want in your meal! This is a really simple but customizable meal to make. Heat up the griddle to 350° F. Once it heats up, take the broccoli and mushrooms onto the griddle. You're almost stir-frying them so keep mixing them around on the griddle with a cooking spoon. Pour the soy sauce, then squeeze/pour the lime juice onto the veggies. Continue to mix and sauté the veggies until they are cooked to the way you desire it. Plate it. Turn off and briefly clean off the griddle. Turn it back on to 350° F and pour a quarter-sized amount of cooking oil onto the griddle. This will keep the salmon from sticking to the griddle. Take the salmon filet and put it onto the griddle. Let it cook and flip it over to the other side when the salmon has turned into a lighter pink. Once you've flipped it over, you may add some more lime juice to the salmon, but this is optional. The salmon is cooked when it is a light pink with some browning on it! Add it to the veggies and you're all done! Your dinner is ready to eat, and if you cooked rice like me, you can also eat it with that. I like adding the rice to my meals not only because I grew up eating it, but it makes the meal much more filling. With this griddle, I'll definitely be experimenting some more with dorm-friendly recipes, and I'll try to share them (with more photos) in the future! What are your favorite dorm recipes? I'd love some ideas so if you have a link, link to it below as well! That looks so good and is such a great idea! You should totally do a whole series on healthy dorm meals! I'm sure a lot of college students would love that! I'm always looking for good salmon recipes. It's one of my favorite fish (to eat). I definitely have to give this a try. Yum! Yummy yummy!!! That looks so good-- I love salmon and am always looking for more yummy recipes! I will definitely need to try this one out. Thanks Sarah! I've been thinking about doing a new recipe a week or attempts at doing recipes (including failed attempts), but I'll have to brainstorm a little bit more. I definitely want to do that! Hopefully I can figure out something! I know, I'm wishing I could have some as well! You definitely should! It's so easy and pretty healthy--at least in my standards, haha.